4.8/5 out of 662 votes. 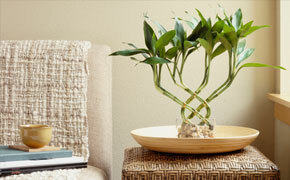 Place the lucky bamboo in a warm spot where it will get indirect light. Keep an eye on how much light the plant gets, if anything, too little light is better than too much. While you're gone, turn the air off, too. It'll be nicer for the plant if it's a little warmer. As the seasons change, you may want to move the plant. Take it away from any windows if you're unsure. It'll still get plenty of light in the center of a room. Change the water every week if you're growing it hydroponically. And as for what water to use, this plant is very sensitive to chemicals like fluoride and chlorine, only use tap water if it's been sitting out for 24 hours (so the chemicals can evaporate). Otherwise, bottled water is best. Once the plant has grown roots, the roots must be kept covered with water. Again, 1-3 inches is all it takes. If you're growing your plant in soil, water it just enough so the soil is moist but not soggy. Keep it this way every day. The plant can get dry-rot if the soil is too wet. You can also spray the leaves with water to keep it moist and humid. Again, use filtered or bottled water to avoid chemical damage. Encourage more roots by increasing the amount of water in which the plant is growing. More roots mean lusher top foliage; the higher the water is up the stalk, the higher up the roots will grow. Fertilizer your plant every month or so. If you're using soil, use organic fertilizer every month or so so the plant gets enough nutrients (again, go organic as synthetic can cause deterioration). If you're growing it hydroponically, use liquid fertilizer in the water. Add it at the same time as you add the rest of the water; it's best to add fertilizer when the water is clean.